(Lowell) Merrimack Repertory Theatre (MRT) and UMass Lowell are excited to announce a series of special events during the run of Beat Generation and the Jack Kerouac Literary Festival. Kerouac fans who attend select performances will have the opportunity to attend pre-show book signings and participate in post-show discussions with Kerouac contemporaries David Amram and Joyce Johnson, authors Anne Waldman and Marilene Phipps-Kettlewell and Beat literature scholars Michael Millner and Todd Tietchen. The World Premiere staged reading of Beat Generation will be performed in MRT’s intimate newly renovated 279-seat theater. Order your tickets soon – only a limited number of tickets will be available to this moment in literary and theatrical history. Tickets start at $40 and can be purchased at MRT.org or by calling the MRT box office at 978-654-4678. 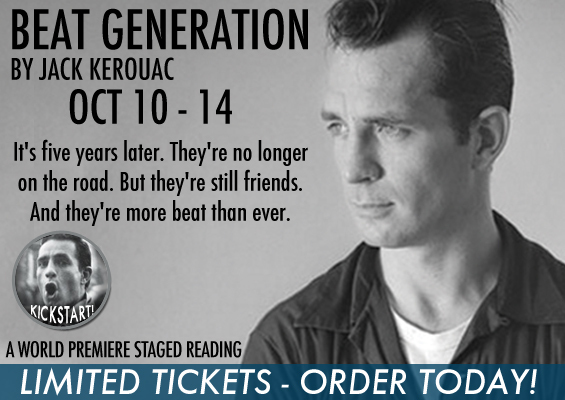 The centerpiece of the 2012 Jack Kerouac Literary Festival, Beat Generation runs for eight performances only Oct. 10 through Oct. 14. This entry was posted in Listings, Other and tagged 2012, Anne Waldman, Beat Generation, David Amram, Jack Kerouac Literary Festival, Joyce Johnson, Marilene Phipps-Kettlewell, Merrimack Repertory Theatre, Michael Millner, October, Todd Tietchen, UMass Lowell by Kitty Drexel. Bookmark the permalink.